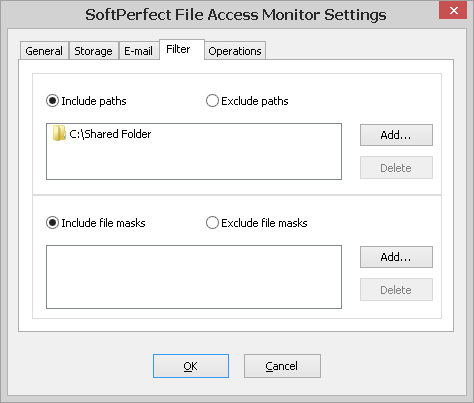 SoftPerfect File Access Monitor consists of two components: File Monitoring Service that keeps track of accessed files, and Management Console used for configuration and monitoring. When you launch the Management Console it asks you to enter the name of the host where the File Monitoring Service is running and a password. 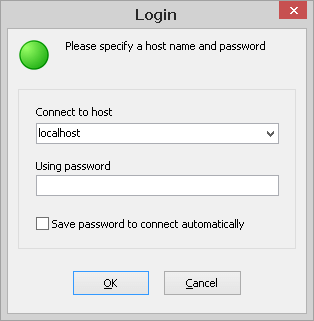 By default, the host name is localhost and the password is blank. If you installed the service on another computer, enter its IP address or name to access it. Upon logging in you will see the main window and probably some operations already recorded. To specify what gets recorded and what doesn’t, see the Settings section below. 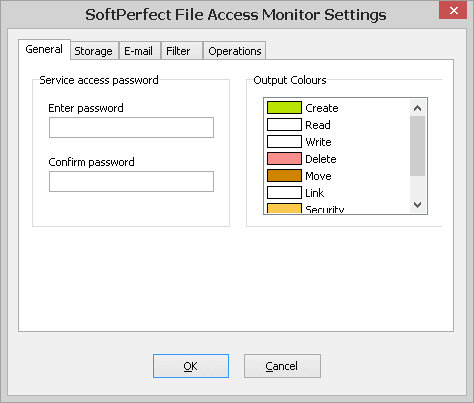 At the General tab you can secure the monitoring service against unauthorised access and choose colour-codes for specific operations. The Storage tab lets you choose how long records should be kept for, as well as delete everything from the database and start afresh. It is recommended to use a shorter retention period where possible, for better performance. 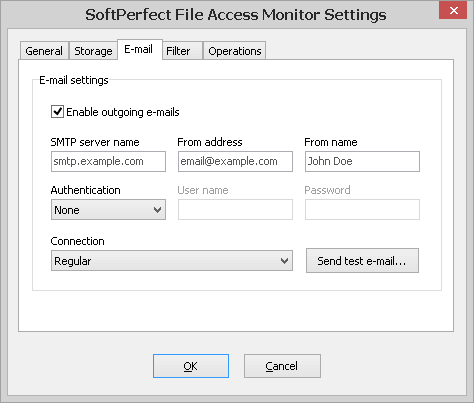 For sending outgoing e-mails, for example with automatic reports, enter your e-mail parameters here. The SMTP server name, From address and From name parameters are required. The Authentication, User name and Password parameters are optional. If you want to send e-mails through an SSL connection, you might need to download OpenSSL libraries. To narrow down what should be recorded, you can include and exclude items at the Filter and Operations tab. 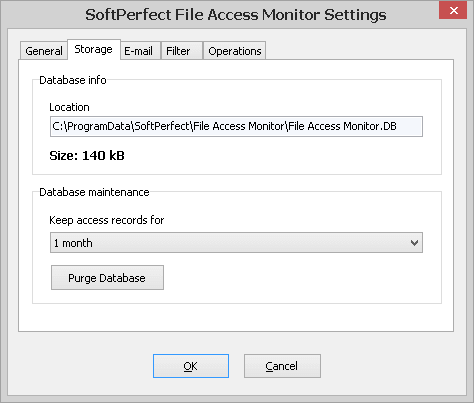 Once you set those, it makes sense to start over with a blank database by clicking Purge at the Storage tab. 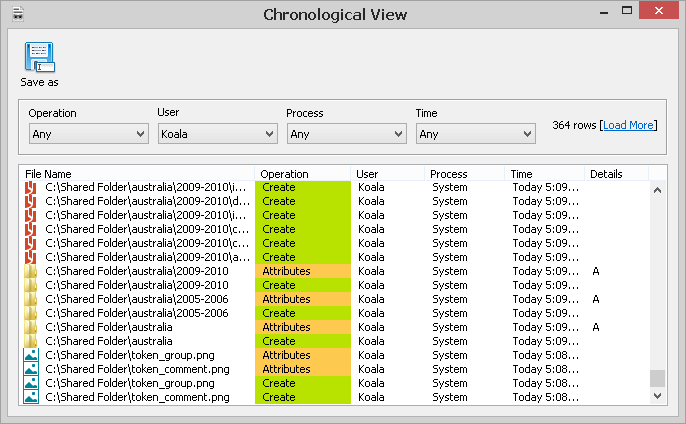 While the main window represents recorded operations in a directory structure form, sometimes you may want to see the activity of a specific user or process. For that, click the Chronological button in the main window toolbar. 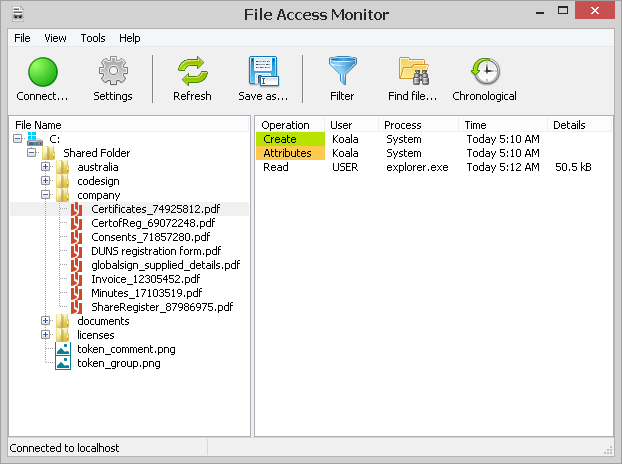 In order to quickly locate a file and see operations performed with it, click the Find file button in the main window toolbar. 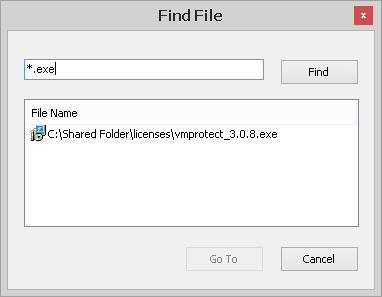 From the Find File window you can jump straight to the file in the directory structure. If you require a report to be generated automatically, check out Tools – Report Manager. In that section you can define one or more reports to be built every hour, day, week or month. A report is generated for the past hour, day, week and month respectively. Email. When the due time comes, a report is sent by email to a specified email address. File. 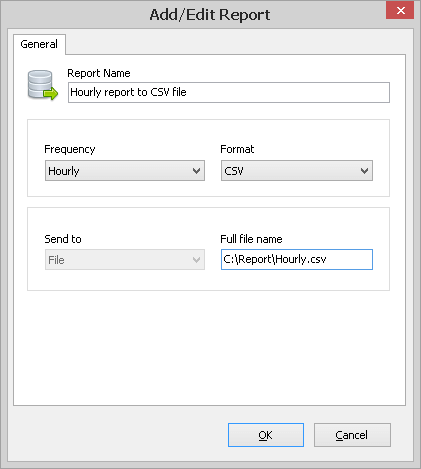 When the due time comes, a report is written to a specified file. It is also possible to add the current date and time to the file name, for example date_%yyyy%%mm%%dd%_time%hh%%nn%%.csv.